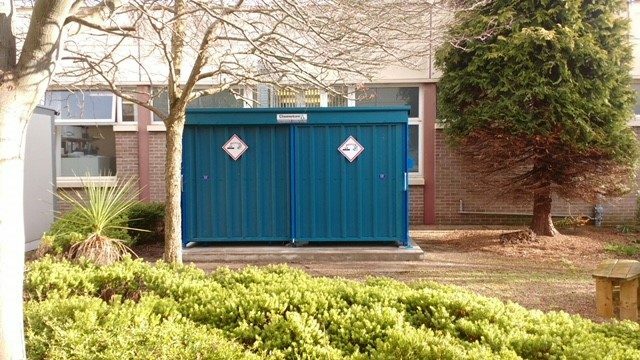 Flatpack store for Craigavon Hospital – Chemical Treatment Services Ltd.
Chemical Treatment Services Ltd required a flatpack store which could be assembled easily on site. The store was to be assembled at the rear of Craigavon Hospital through a single door. This was an unusual and unprecedented project as all manufacturing parts were required to meet the dimensions of the single door. A segregation wall and shelving on either side was required to support a dosing pump. Two separate polyethylene bunds were required in each compartment. This was due to the corrosives being used in the process (Sodium Hypochlorite & Sodium Bisulphate). 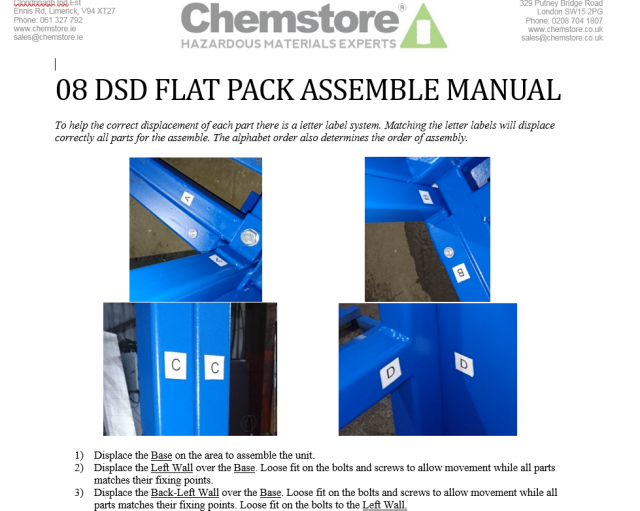 We provided a full instruction manual to allow for easily assembly on arrival. This can be seen in the gallery below. 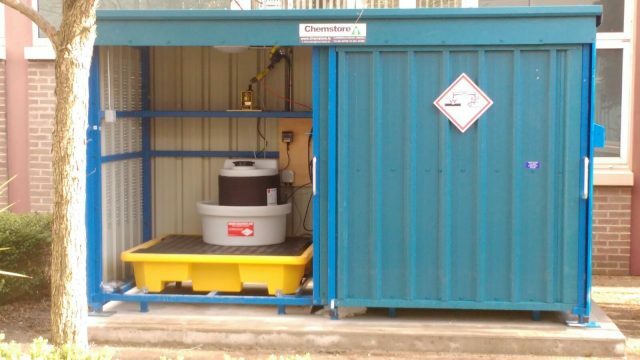 Chemical Treatment Services Ltd had a requirement for a flatpack chemical store to house chemicals for dosing a hydrotherapy pool. We had a very tight timeframe to complete the works. We had contacted another company to supply the store but they could not meet the deadlines. 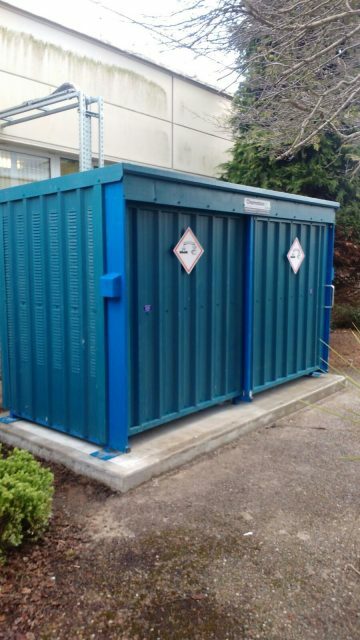 We contacted Chemstore early in January to see if they could build a chemical store for us and deliver it to N. Ireland. The delivery was key to the project and deadlines had to be met. 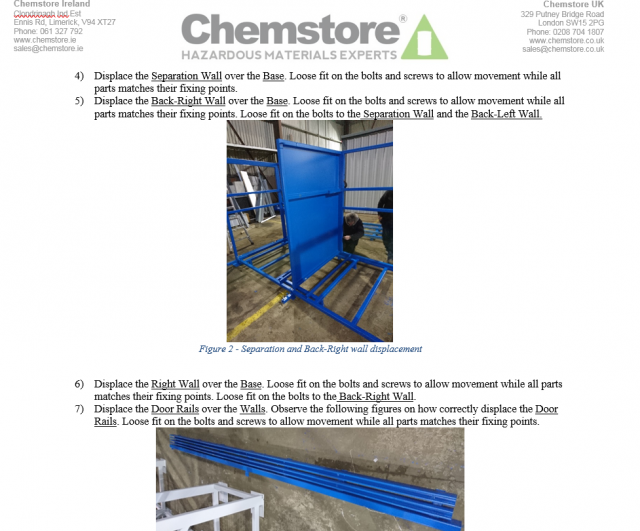 Once contacted Chemstore were very prompt in sending a quote for the store as per our requirements. They confirmed that a delivery by the end of January was possible and we ordered the unit. Within days the colour and design on CAD drawings was sent to us for approval. We confirmed and store was ready to manufacture. Once the store had been manufactured it was then delivered as agreed directly to site. We found Chemstore very helpful and would have no hesitation is recommending them to other clients with similar requirements. Storage: 2 pallets, 8 x 200L drums (2 x 1,000L IBC’s), stored on 1 level with divider wall. Shelving on both sides of unit. Construction: Robust all welded 100mm x 50mm mild steel box section frame. 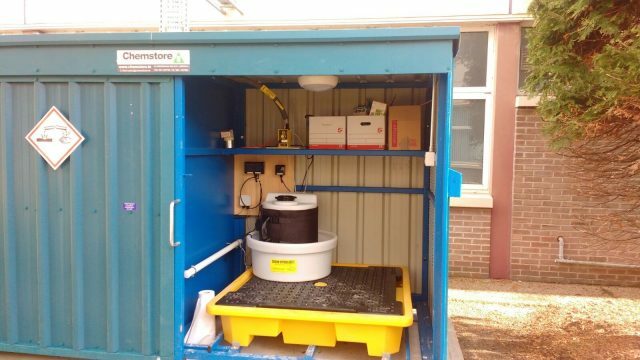 Sumps: Corrosion resistant 2x Poly tray fitted under lower shelf level. 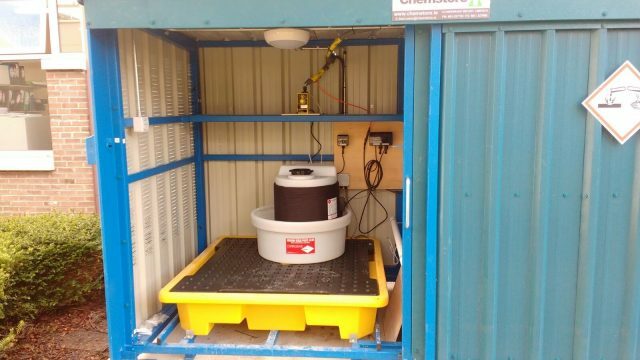 Total Capacity: 250 litres (exceeds current EPA guidelines, 25% of the total volume). Shelving: Full width, 700mm deep shelving along back wall. Shelf and floor level layered with fully galvanised grid decking. Access: Henderson heavy duty sliding twin access doors, fully padlockable. Ventillation: Louvred cladding panels ensure airflow throughout the store. Wall/Roof/Door Cladding: The profiled, single skin cladding is fabricated from a Zintec based, corrosion resistant alloy which is then Plastisol coated. Choice of colours. Standard colour: Goosewing Grey. Finish: All steel coated with high build Acrylic paint finish system to ISO 3233:1998.